Are you thinking of planing red-tip photinias? Please don't until after you have read this post and decide for yourself if the advantages are worth the disadvantages. Red-tips were planted widely in North Texas in the mid-1990's. They are drought tolerant, tough, and vigorous. They seemed to be the perfect plant for the Texas climate as they will tolerate Texas sun and usually need little maintenance. The shrub--technically a tree--can easily reach 10 to 15 feet tall and stretch to 5 to 8 feet wide and provide privacy on small lots. Best of all, it grows rapidly and provides attractive foliage. However, disadvantages are many. First, red-tips are vulnerable to Entomosporium, or fungal leaf spot. If not controlled, the disease can cause complete defoliation. 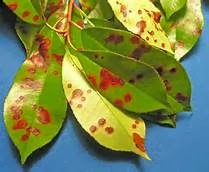 Once established the disease is difficult to eradicate and causes massive leaves to drop. This disease has destroyed thousands of red-tips nationwide and has given the shrub a negative reputation, especially in the south. Excess moisture on the leaves from humidity or landscape watering and a lack of circulation between plants are the two prime factors contributing to the disease. In Texas, our omnipresent sprinkler systems water the leaves on the plants which are planted too close together to provide adequate circulation. Second, the plant's admirable qualities can quickly turn into negatives as rapid growth turns into an unwanted invasion. Red-tips can outgrow and overwhelm your landscape in a short time. More importantly, as the roots search for water, they can drain the soil of moisture needed to maintain the foundation. As they continue to search for water, the roots move under the foundation and break the concrete and the foundation beam wall. 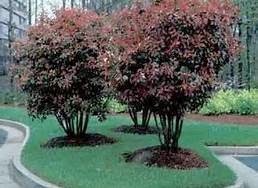 According to Neil Sperry, well-respected North Texas gardening expert, hollies such as the yaupon, Nellie R. Stevens and Mary Nell, the Japanese ligustrum, and the Chinese photinia are all well-suited to substitute for the red-tip. 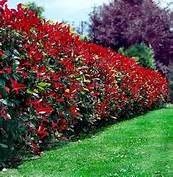 Visit our website for additional options on fast growing screening shrubbery to plant around your home.